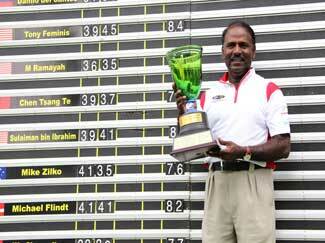 Congratulations Gunasagaran (Malaysia) who made golfing history as the 1st Malaysian professional golfer to ever play in the USA when he represented the Asian Seniors Tour against most of the world's leading senior professional golfers at the US$ 2.1 million purse Insperity Invitational presented by United Healthcare staged at the Woodlands CC in Houston, Texas from 2 to 8 May 2016, where Guna returned a most respectable 3 day 54 hole total score of 222 at 6 over, to come in tied for 48th place. 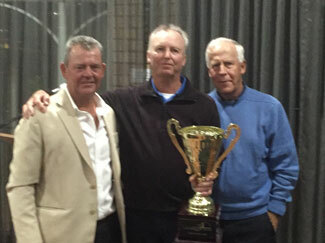 The Woodlands Country Club in Houston, representng the AST, playing in a US Champions Tour event. 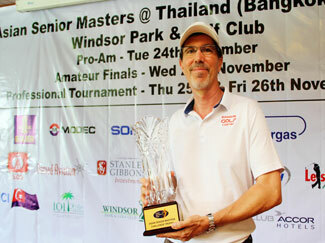 The AST will continue with its efforts to secure additional playing opportunities for its members at other Senior Tournaments, both in the Asia Pacific region and further afield internationally. The AST / APCT have been generously allocated one place by the Legends Tour for our leading member to play and contest the Australian - Ladbrokes Legends Tour's biggest event of the year, The New South Wales Senior Open 2017 which will be stage at Thurgoona Golf Resort from Thu 2 to Sat 4 Nov and offers a min AU$ 100k purse. This is indeed a great honour, and given that the starting field will be 120 and will be cut to 50 after 36 Holes so our man had best be on his toes! In 2018 the AST have been allocated 2 places for our leading members to play in the New Zealand Masters at Chisholm Links 2018 offering one of the largest purses on the NZ circuit, to be staged at Chisholm Links GC, Dunedin on Sun 25 & Mon 26 Feb offering a min NZ$ 50k purse, this is indeed a great honour. AST Qualifying Schools are conducted in in Malaysia several times a year and also in other countries, prior to the AST's Spring, Summer, Fall and Winter Seasons. 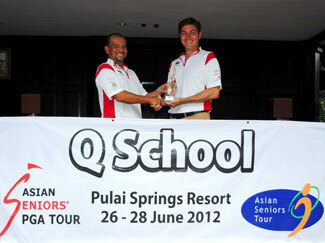 AST Qualifying School is also conducted as PRO Qualifier events staged during all ASM tournaments. 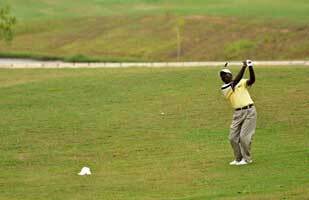 It will cost a Senior Professional who is NOT a member of the AST between US$ 250 and US$ 350 extra to play in an ASM event depending upon the prize money on offer, so it does make sense to join.. The AST wish to thank and acknowledge our long standing main tour sponsors, Thai Bauer - Giant - Integra - Nomad Aviation - CIES - Stapleford Park - Nimoi Holdings - Tarpon and the Oxley Capital Group along with our numerous supporting sponsors, host venues and official hotels who make it possible for the AST to stage our annual season of ASM tournaments and for our champions to compete in the USA. Your long standing friendship and support is greatly appreciated and we look forward to seeing you and to entertaining your guests at our forthcoming events during the AST's 2017 season. Tering Bay GCC from Sat 4 to Mon 6 June 2016. 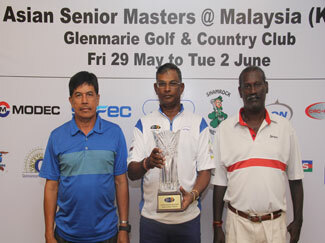 Congratulations Gunasagaran (Malaysia) Champion at the 12th ASM @ Malaysia (KL) staged at the Glenmarie GCC from Sat 28 to Tue 31 May, the leader from start to finish, returning a 2 day score of 144 at level par with a comfortable 4 shots ahead of the pack with Scott Puzey (USA), Mike Zilco (Australia) and Rene Larson (Denmark) who all tied for 2nd place with 148 at 4 over. 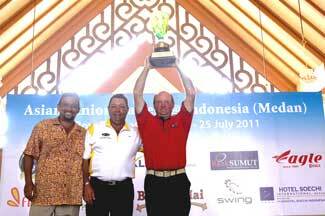 Le Club Accor Golf Championship 2015 pan-Indonesia series of amateur golf tournaments. 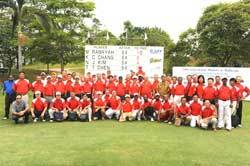 Garuda Indonesia Golf Challenge (Jakarta) 2015 series of 3 day - monthly amateur tournaments. 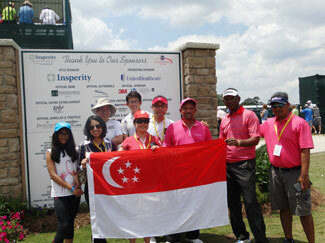 Congratulations team Malaysia on your victory!! 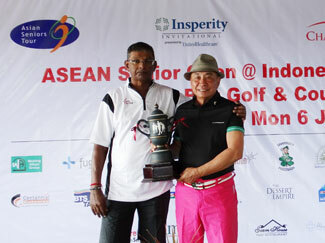 the AST Player's Championship 2014 and the 2nd edition of the AST's US Champions Tour Qualifier event during which Singapore's Murugiah narrowly beat Gunasegeran (Malaysia) on the last hole of the 3 day - 54 hole tournament to win the honour of representing the AST at the Insperity Invitational 2015 to compete in the Champion’s Tour event alongside the world’s leading senior professional golfers such as 2014 defending Champion Bernhard Langer, Fred Couples and Colin Montgomerie. This is a new and exciting chapter in Singapore's long established golfing history as Murugiah will be the first Singaporean to ever play in a US Champion's Tour event - we wish him all the very best !! The AST wish to thank and recognise the following sponsors without whom it would not be possible for the AST to stage our Spring & Summer season 2015 comprising the 7th ASM @ Batam staged in March, and the 11th ASM @ Malaysia (KL), the 5th ASM @ Indonesia (Medan) events in late May / early June during the AST's Summer Season as well as the 3rd NORGAS Peninsular Cup and the inaugural edition of the ASM @ Indonesia (Jakatra) to be staged in November during the AST's Winter Season. 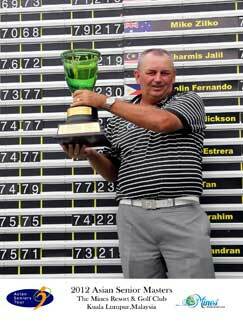 Congratulations - Jong-Duck Kim (South Korea) the Champion at the 2014 Fubon Senior Open who led from start to finish. 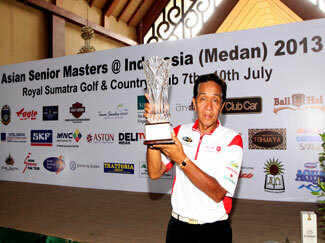 The Asian Senior Tour's Summer Season 2014 that was staged from 28 May through 16 June members the opportunity to play for about US$ 85,000 @ RM 280,000 in Prize Money during the 3 ASM events staged. 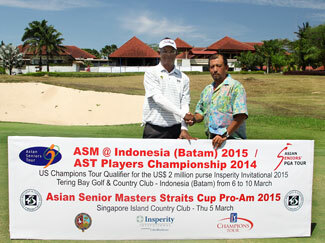 The Asian Senior Tour's Summer Season 2013 staged from 28 June to 10 July including the rescheduled ASM Straits Cup @ Batam 2013 (to be staged in (Johor) provided members with the opportunity to play for RM 330,000 @ US$ 110,000 in Prize Money during the 3 ASM events staged. 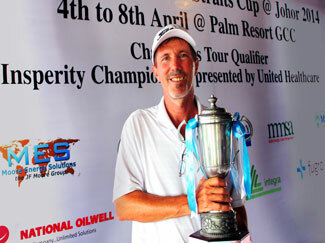 2011 & 2012 Champion Kym Olsen (Australia) course record of 139 at 5 under remains standing. 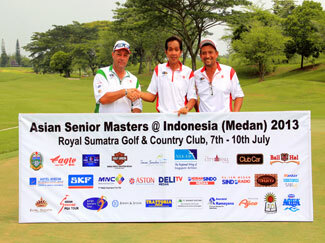 The Asian Senior Tour's Summer Season 2012 staged from 26 Jun to 23 July provided members the opportunity to play for RM 360,000 @ US$ 120,000 in Prize Money during the 4 ASM events staged!! who successfully defended his 2009 and 2010 victories to achieve a hat trick ! 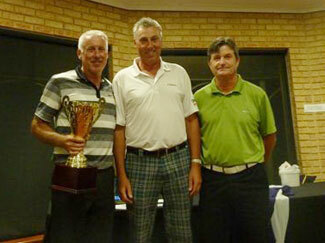 presented by the Oxley Capital Group staged at the Warren GCC. 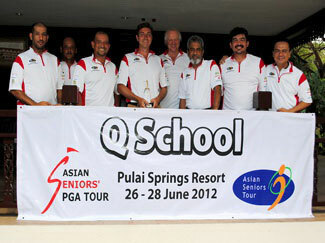 The Asian Senior PGA Tour 2010 Qualifying School (Malaysia) was staged from the 4th to 6th June 2010 at Nilai Springs GCC. 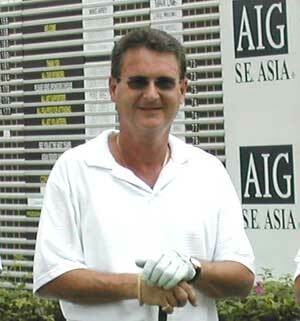 Congratulations to Keith Murray (Australia) who made it through Q school having returned a total of 11 over par during the 3 day Asian Senior PGA Tour 2010 Qualifying School (Malaysia) staged from the 4th to 6th June 2010 at Nilai Springs GCC. 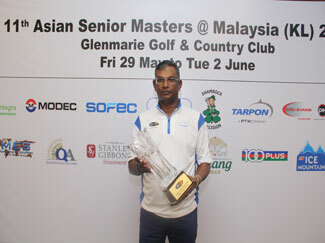 Ramayah Malaysia’s leading senior professional golfer and Vice Chairman of the Asian Seniors PGA Tour has once again proven to all the Asian Seniors Tour participants from around the world that he is currently in a class of his own. 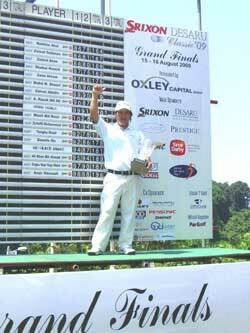 His experience and steady nerves displayed during the 1 hole sudden death play off on the 18th against Nopajak Mesom (Thailand) ensured his victory at the ASM @ Singapore 2009 (Pulai Springs Resort) presented by Oxley Capital Group. 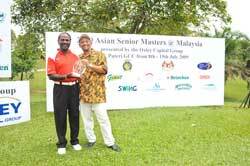 Ramayah lead the 3 day ASM @ Singapore (Pulai Springs Resort) from the start carding an impressive 69 for the first day and then carding steady 72, 72 over the next 2 days to finish 3 under. New comer Nopajak Mesom started with a shaky 74 then went on to recover shooting 69 on the second day to keep him on the leader board, and followed with a steady 72 to also finish 3 under forcing the play off. During the play off both their accurate T shots down the picturesque dog leg 18th hole with a large hazard running all down the left side, landed within 20 feet of each other, well clear off the bunkers, and hazard on the right, leaving both with what should have been quite comfortable second shots to the highly elevated green, with Ramayah to play first. Rather than risk the bunkers and attack the well protected pin, Ramayah played long right and safe, leaving himself a slightly downward lying chip to get on to the green. Nopajak Mesom was less cautious and boldly went for the pin, but alas caught one of the bunkers leaving himself 15 feet from the pin but with about a 15 foot incline and bunker face in the way! 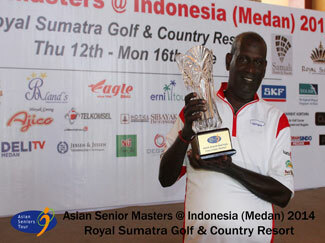 Ramayah chipped to within 12 feet of the pin, and having gathered himself Nopajak Mesom played a great bunker shot to land inside of Ramayah leaving himself a chance to stay in the game, however Ramayah’s steady nerves and accuracy ensured his Par, and unfortunately for Nopajak Mesom his missed putt cost him the Championship. 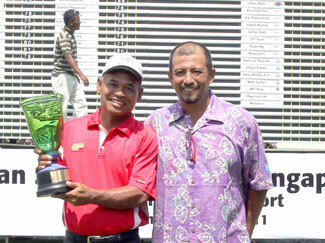 This latest victory makes it Ramayah’s second ASM Championship title for the year having also recently won his first Championship title earlier this year at the annual ASM @ Malaysia presented by Oxley Capital Group staged at the Tasik Puteri GCC in July 2009, and as was the case during the ASM @ Malaysia in July similarly the field contesting the inaugural ASM @ Singapore (Pulai Springs Resort) could not hold up against Ramayah who lead from start to finish. 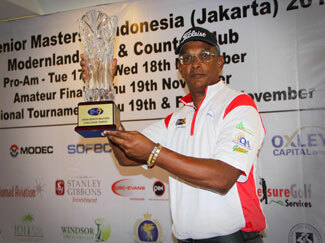 Ramayah’s latest Victory puts him on par with Stewart Ginn (Australia) who up till now has reigned supreme on the AST’s Order of Merit having won the ASM @ Malaysia in 2005 and 2006. For Ramayah after having placed second on more than 3 occasions and always featuring in the top 10 for the past 6 editions of the annual ASM @ Malaysia, in 2009 undisputed Victory is his! David Hutchison (Australia) and Manas Saeng-Sui (Thailand) shooting at level par completed the top 5 on the first day’s leader board. 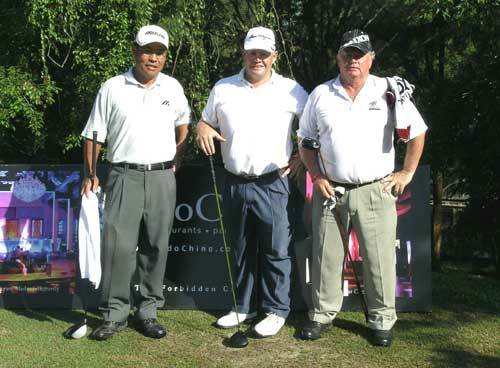 Shooting 73 and standing 1 over were Antolin Fernando (Philippines) Juanito Pagunsan (Philippines) and promising new comer playing in only his second ASM tournament, Kim Jung Nam (Korea) who was 2nd runner up at the ASM @ Malaysia last July 09. 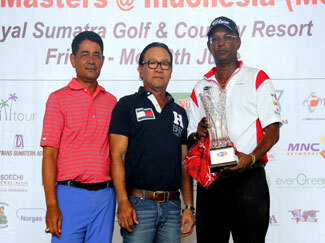 Ramayah (Malaysia) returned a steady 72 to retain the lead at 3 under, but leaving him with only a 1 stroke lead over Somsak Songserm who again returned a commendable 71 to take 2nd place outright at 2 under. Nopajak Mesom equalled Ramayah’s tournament record score of 69 to recover and leave himself at only 1 and back in the back in the game to take 3rd place outright. Chen Tsang Te (Taiwan) the 2007 ASM @ Malaysia Champion who recently placed 4th with 3 under during the 2009 ASM @ Malaysia staged last July returned 72 to recover to 3 over and stay on the leader board, along with Manas Saeng-Sui who took 4th place outright remaining at level par after Day 2. 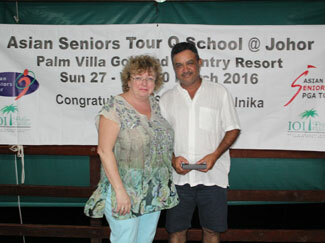 Nopajak Mesom (Thailand) shot a commendable 70, and the Final Days lowest score, which brought him into a tie for 1st place with the tournament’s 2 day leader Ramayah (Malaysia) who along with Arnulfo Kempis (Philippines) returned 72 for even par rounds on the Final Day. 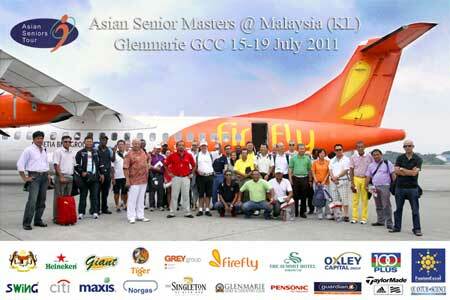 On behalf of the Asian Seniors Tour I wish to extend a big thank you to all participants, both amateur and professional, and to the ASM @ Malaysia series main sponsor's including; Giant, Citi, F&N, 100PLUS, Dewars, GAB - Heineken, LMG, Norgas and Mountain Fresh the AST also wish to acknowledge the kind support received from the Singapore & Malaysian Golf Associations. 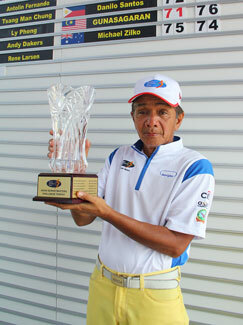 Chan Soo Keong returned 78 & 77 for a total score of 155 to emerge Champion at the 2 day Grand Finals of the Desaru Classic 09 series presented by the Oxley Capital Group. 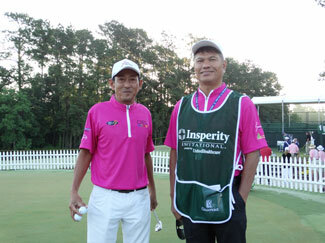 CHAN Soo Keong attended the Asian Tour's 2010 Q School staged in Jan 2010 in Pattaya, Thailand and Chan will also play in an ASEAN Tour event this coming June in Phuket. CHAN is now a regular player on the PGM Circuit of Malaysia along with some 7 other up and coming professionals who have over the years turned PRO by way of the annual Ombak Cup. For Ramayah after having placed second on 3 occasions and always featuring in the top 10 for the past 5 editions of the annual ASM @ Malaysia Victory is finally his. 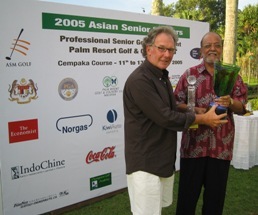 In addition to the 2009 ASM @ Malaysia delivering the FIRST MALAYSIAN CHAMPION to feature on the Asian Seniors Tour, the 2009 ASM @ Malaysia will also be remembered historically for the foundation of the ASIAN SENIORS PGA TOUR a players governing body with 28 elected representatives from some 25 countries operating under the auspices of the Asian Seniors Tour. Ramayah started with 67 to lead after the first day with 5 under, (with a 2 stroke lead) trailed by (Korean) - Kim Jung Nam and the defending Champion Sutep Bunpimuk - (Thailand) with 3 under, with Eduardo Bagtas - (Philippines) and Chan Chin Kuo - (Taiwan) both returning 1 under. 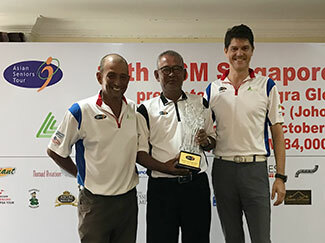 The Final Day of the 5th edition of the ASM @ Malaysia saw Ramayah return 1 under 71 to retain and increase his lead to 10 under, resulting in a 4 stroke lead over 1st runner up Chan Chin Kuo - (Taiwan) who shot level par to put him in second place with 6 under, followed by 2nd runner up Kim Jung Nam - (Korean) shooting 69 on the final day, playing under Seniors PGA the Philippines flag came 3rd on his first appearance on the Asian Seniors Tour shooting a credible 4 under. 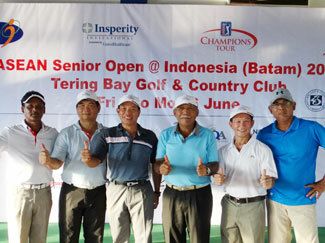 Also shooting 69 on the final day were Chen Tsang Te - (Taiwan) who placed 4th finishing with 3 under, along with Bill Fung - (Singapore), Eduardo Bagtas - (Philippines) and defending Champion Sutep Bunpimuk - (Thailand) all finishing in join 5th place with a 3 day total of 1 under par. 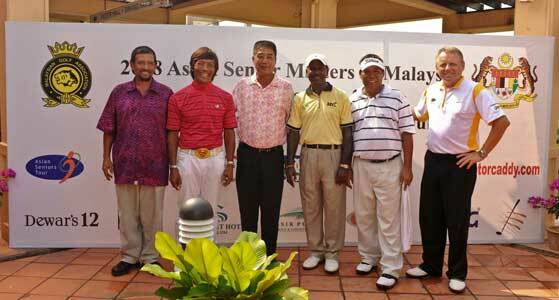 The 2009 ASM @ Malaysia Leader Board after Final Round Wednesday 15th July 2009. 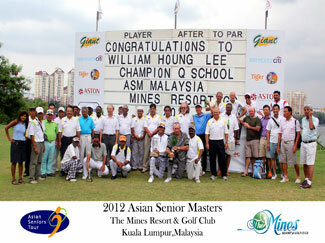 We were most appreciative and pleased to see so many of you our regular amateur golfers back once again to play in the various ASM @ Malaysia Pro-Ams and we remain grateful for your past and on going support and that of the past and defending ASM @ Malaysia Amateur Champions returning to contest and defend their ASM @ Malaysia Amateur Champion titles each year. 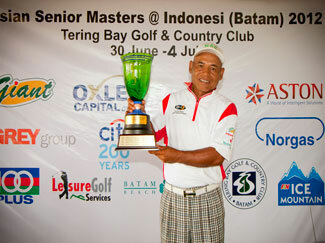 The Asian Seniors Tour moves on to Indonesia for the 2nd edition of the Asian Senior Masters @ Indonesia (Batam) Invitational from 17th - 19th July 09 at Tering Bay GCC. 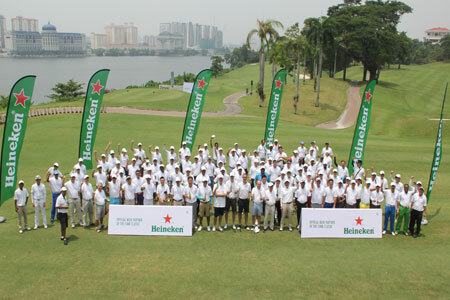 The Asian Seniors Tour wish to extend a big thank you to all participants both amateur and professional and to the ASM @ Malaysia main sponsor's including; Giant, Citi, F&N, Dewars, 100PLUS, GAB - Heineken, Tasik Puteri GCC, Summit Hotel Subang, Swing, and LMG the AST also wish to acknowledge the kind support received from the Malaysian Golf Association. 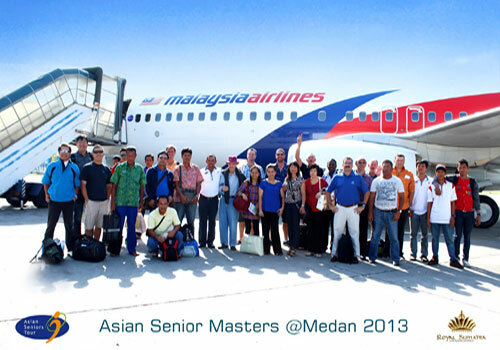 As with previous ASM @ Malaysia tournaments, the professional field comprised a diverse field with participants hailing from Thailand, Malaysia, Indonesia, the Philippines, Taiwan, USA, England, Scotland, Australia, Singapore, Switzerland, Dubai, South Africa, Canada, and France. 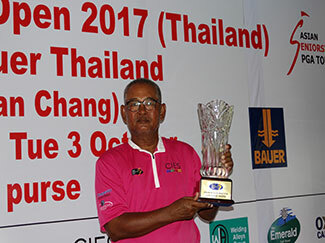 Sutep Bunpimuk - (Thailand) closed and later reversed M Ramayah - (Malaysia) 2 stroke lead on the final day to emerge as this year’s ASM @ Malaysia Champion. 2008 ASM @ Malaysia leaders & last flight on the final day, from left to right, Ramayah, Bagtas and Sutep. 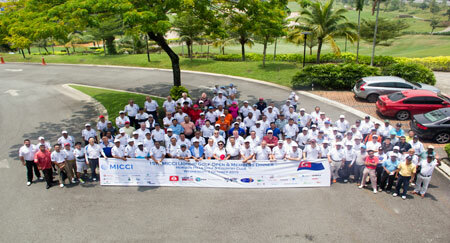 The 2008 ASM @ Malaysia was staged from 17th - 19th October 2008 at Tasik Puteri GCC. It all came down to the 18th when unfortunately Ramayah's approach shot went wide, ending his chances of forcing Sutep into a sudden death play off. 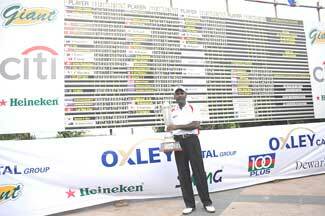 For Ramayah this was such an unfortunate outcome, and echo's the final day of the 2007 ASM @ Malaysian, when Chen Tsang Te from Taiwan managed a final round 68, including a birdie on the 18th, to beat Ramayah, who also birdied the last hole. 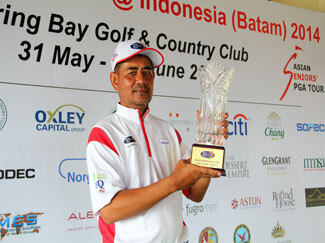 Chen returned a tour record winning score of 10 under par 206, beating M Ramayah by a single stroke. 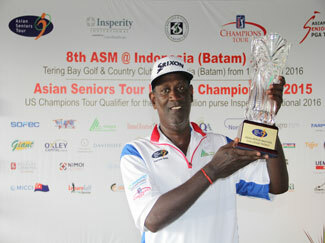 Ramayah a regular on the Asian Seniors Tour since its foundation in 2003 and has consistently placed high up on the ASM leader boards, we wish him better luck next year and hope that he might emerge as the first Malaysian to win an Asian Seniors Tour event. 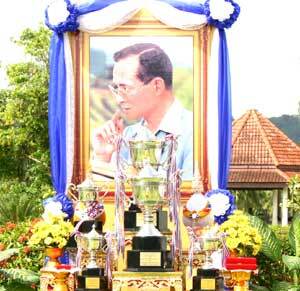 Here's to his success at the 2009 ASM @ Malaysia. 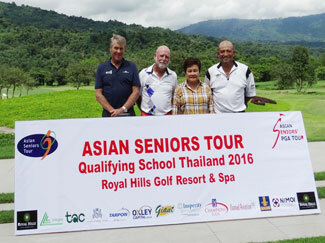 From left to right- Chuan Campbell - Chairman of the Asian Seniors Tour, Sutep Bunpimuk, Lai Chung Hui, M Ramayah, Eduardo Bagtas and George Okrasa - Tournament Director. 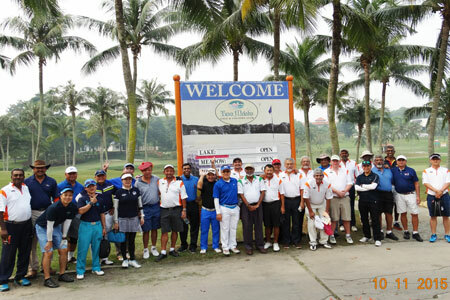 The 4th edition of the annual Asian Senior Masters @ Malaysia was undoubtedly the most ambitious event yet, with the various Pro-Ams being staged at different venues, including IOI Palm Garden GC, Glenmarie GCC, Saujana GCC and Tasik Puteri GCC prior to the ASM @ Malaysia championship. The 2008 ASM @ Malaysia Amateur Champion, Wong Tan Khua shot a commendable 76 to lead the field followed by Hamdan Zambahari shooting 77 coming in 2nd. 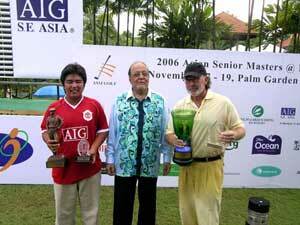 Defending 2007 ASM @ Malaysia Amateur Champion Wong Pau San along with Chen Yew Beng who both shot 79 came join 3rd. 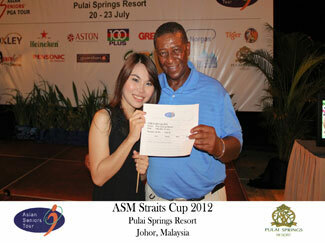 We were most pleased to see so many of the regular ASM @ Malaysia semi-finalists contesting this year's event. 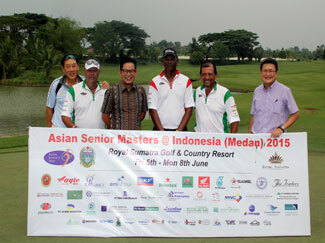 Asian Senior Masters @ Batam from 21st - 24th October 2008. The 2008 ASM @ Malaysia Leader Board after Final Round Sunday 19th October 2008. 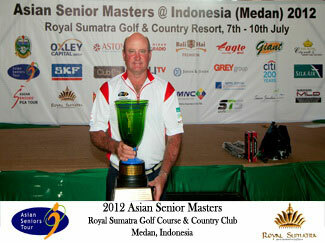 The Asian Seniors Tour wish to extend a big thank you to all participants both amateur and professional and to the ASM @ Malaysia main sponsor's including; Giant, Citi, F&N, Dewars, 100PLUS, GAB - Heineken, Tasik Puteri GCC, Summit Hotel Subang, Swing, motocaddy.com, and LMG the AST also wish to acknowledge the kind support from the Malaysian Golf Association. As with previous ASM @ Malaysia tournaments, the professional field comprised a diverse field with participants hailing from Thailand, Malaysia, the Philippines, Taiwan, USA, England, Scotland, Australia, Singapore, Switzerland, Dubai, South Africa, Canada, and France. 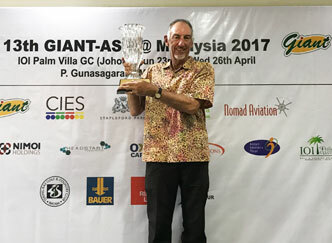 Ron Hendrie - (Australia) having tied with Lingham - (Singapore) and Ross Metherall - (Australia) mentor and fellow country man shooting a 2 day 154 played in a 3 way play off to emerge as this year’s ASM @ Singapore Champion. 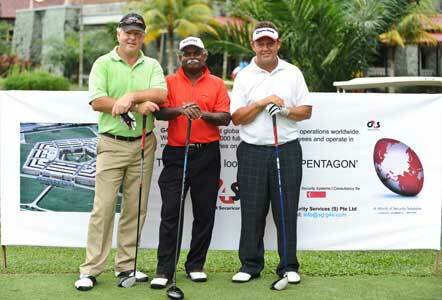 2008 ASM @ Singapore leaders & last flight on the final day, from left to right, Ross Metherall, V Lingham, and Ron Hendrie. The 2008 ASM @ Singapore - (Batam) was staged from 21st - 24th October 2008 at Tering Bay GCC. It all came down to a 3 way 2 hole play off on the 10th & 18th, where on 10th Ron and Lingham delivered Pars with Ross dropping a stroke, and it was all over by the 18th when Ron delivered a birdy. 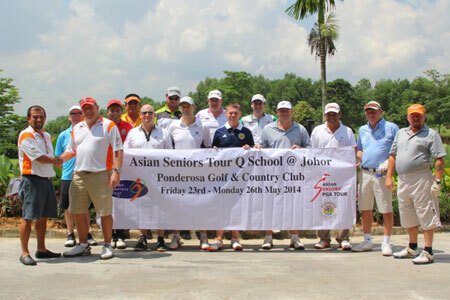 Ron, Ross and Lingham have been regulars on the Asian Seniors Tour since its foundation in 2003. 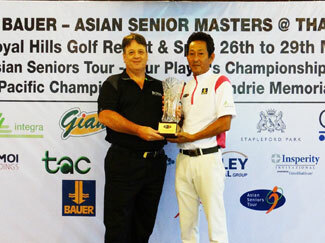 The 5th edition of the annual Asian Senior Masters @ Singapore Amateur Champion, saw Doly from Tering Bay GCC shooting a commendable 77 to lead the field followed by Chris Yeo and Chuan Campbell shooting 81 to come in joint 2nd. 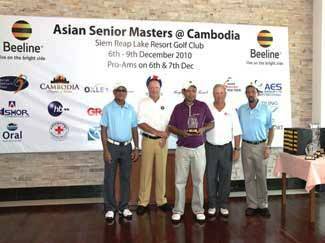 The Asian Seniors Tour moves on to Taiwan for the staging of the inaugural Asian Senior Masters @ Taiwan CVL - PGA Senior Open from 30th October - 1st November 2008. The 2008 ASM @ Singapore - (Batam) Leader Board after Final Round - Friday 24th October 2008. As with previous ASM @ Singapore tournaments, the professional field comprised a diverse field with participants hailing from Thailand, Malaysia, the Philippines, Taiwan, USA, England, Scotland, Australia, Singapore, Switzerland, Dubai, South Africa, Canada, and France. 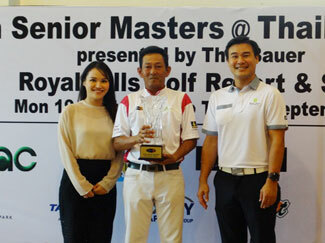 The 2007 Asian Senior Masters @ Malaysia now in its 4th year once again provided an exciting finish with Chen Tsang Te from Taiwan managing a final round 68, including a birdie on the 18th hole, to beat Malaysia's M Ramayah in the same flight, who also birdied his last hole. 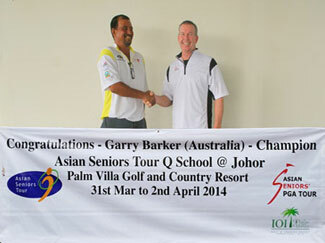 Chen returned a tour record winning score of 10 under par 206, beating M Ramayah by a single stroke. 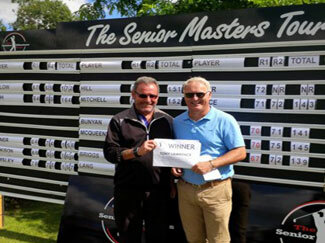 Craig Owen from New Zealand was well in the running until he triple bogied the 17th hole to finish in third place on six under par 210 after shooting a one-under par 71 final round. 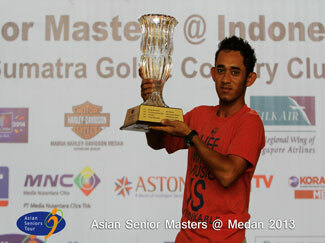 2006 ASM @ Singapore Champion and last year's ASM @ Malaysia runner up, Amphon Maneerat from Thailand, tied for fourth place after returning a final round 69, along with 2006 ASM @ Phuket Champion, Chung Chun Hsing from Taiwan and Asian Seniors Tour newcomer David Saunders from Australia, all on a total three-round score of 212. 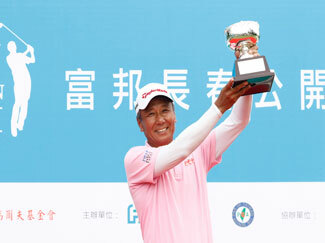 Just one shot back was Taiwanese legend, Hsieh Min Nan who at one stage during the tournament, was within two strokes of the lead, but dropped back to finish on a three under par total of 213. 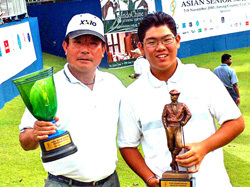 Palm Garden Golf Club's Amateur Champion, Wong Pau San, won the 2007 ASM @ Malaysia Amateur Championship with a commendable 74, just managing to hold off Chan Sin Long and defending 2006 ASM @ Malaysia Amateur Champion Iylia Jamil, both of whom returned scores of 75. 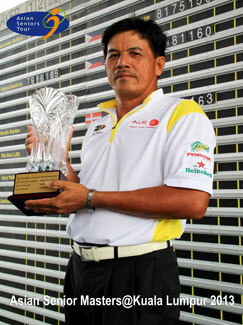 Chen Tsang Te's first success on the Asian Seniors Tour should propel him to even greater heights. 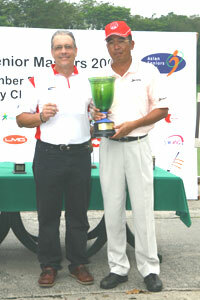 The following week the Asian Seniors Tour moved on to Singapore to the Jurong Country Club for the AIA Singapore Asian Senior Masters 2007. 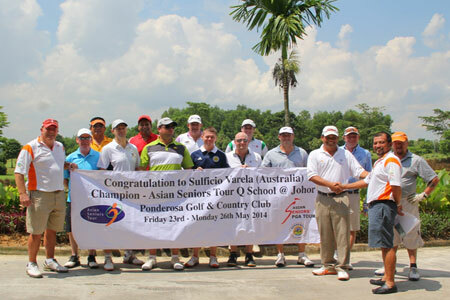 Jurong have played host to the annual ASM @ Singapore tournament for the third time, since playing host to the inaugural 2003 ASM @ Singapore, and the AIA Singapore Asian Senior Masters 2007 will feature a full field of 120 senior professional golfers including most of the 2007 ASM @ Malaysia field. 2007 ASM @ Malaysia - Leader Board after Final Round Sunday 9th September 2007. 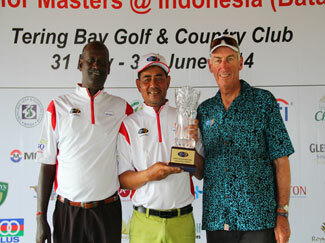 Tied in second place on 4-under par were American, Peter Teravainen, Eduardo Bagtas from the Philippines, Craig Owen from New Zealand and Phachoen Prempleeda from Thailand. 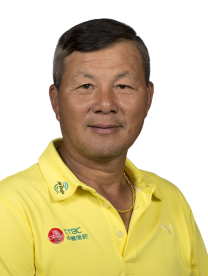 Singapore also featured in the top ten with local favourite Poh Eng Chong returning a great last round 3-under par 69 to finish on a 3-under total of 213 which was matched by Australia's David Saunders, after he shot the low round of the day, a 6-under par 66. 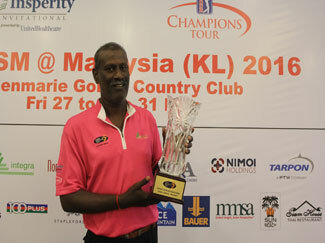 Saunders also challenged in last week's 2007 ASM @ Malaysia event and it will only be a matter of time before he breaks through for his first major Asian Seniors Tour victory. Singapore based Terevainen, playing in his first Asian Seniors Tour event, had plenty of opportunities to challenge the overnight leader Chung. 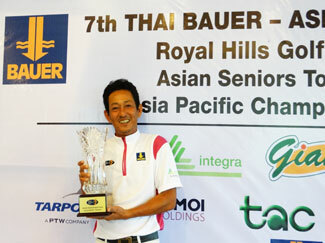 In the end Chung only needed to shoot a last round event par 72 to hold off Teravainen and the other determined challengers to record his second victory on the Asian Seniors Tour. 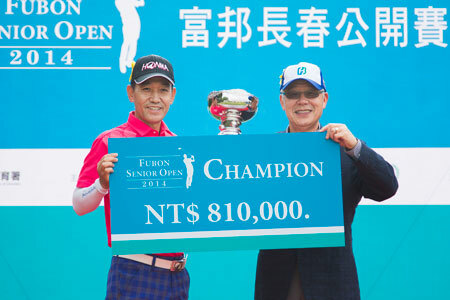 The legendary Hsieh Min Nan once again showed the young seniors a thing or two by returning an even par 216 on a course that some of the new seniors found, at the very least, challenging. 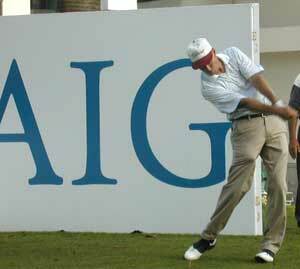 The final round of the AIA Singapore ASM 2007 also resulted in another impressive winner of the AIA Singapore ASM Amateur Championship, one of Singapore's leading junior prospects, Joshua Shou (SICC), who fired an impressive two under par 70 to just edge out Gregory Foo (SICC) who returned an even par 72. Just one shot back in third place was Russell Lim with a 1-over par 73, and a star of the future, 11 year old Jennifer Yan, who shot consecutive rounds of 76. 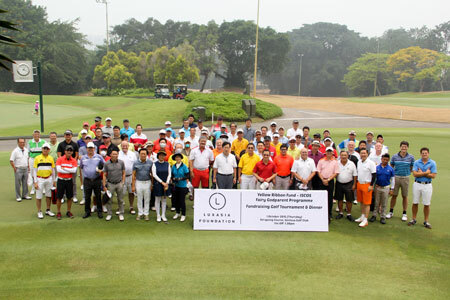 Main sponsors, AIA Singapore, announced that they were well pleased with the success of the tournament and plan to continue to ensure that the AIA Singapore ASM 2008 event will involve even more of Singapore's leading amateur and junior golfers. The ASM tournament format allows leading juniors and amateurs golfers of all ages and gender the opportunity to play alongside the Legends of Golf under testing tournament conditions, thus resulting in quality golf and future champions taking home the overall amateur title. The 2008 AIA Singapore ASM will also for the first time feature an AIA Singapore 8 ball pool tournament featuring an as yet to be decided cash prize to the top 3 participants, open to ONLY the amateur and professional golfers contesting next years 2008 AIA Singapore ASM event. 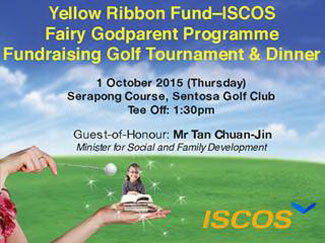 There is expected to be a modest SG$ 10 entry fee with all proceeds being donated to the SGA and SLGA Junior Golf development fund. 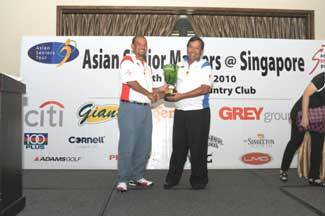 The 2006 ASM Singapore was staged from 8 - 10 November 2006 at the Jurong Country Club. 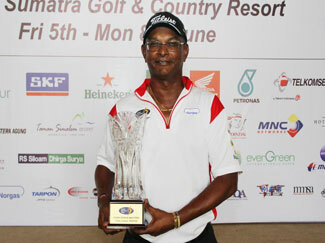 Amphon Maneerat came from two behind on the final day with a tournament equal low round of 69 to capture the 2006 ASM Singapore with a three day total of two under par 214. 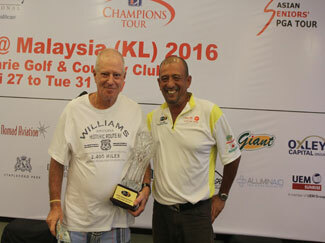 Third place on 218 went to Don Klenk of the United States playing in his first Asian Seniors Tour event. 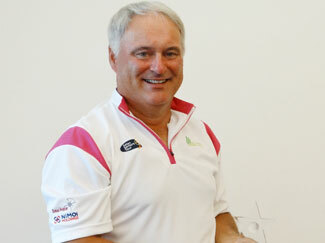 Amphon says "he is very happy to play in Singapore on such a fine course and win on the tour for the first time." 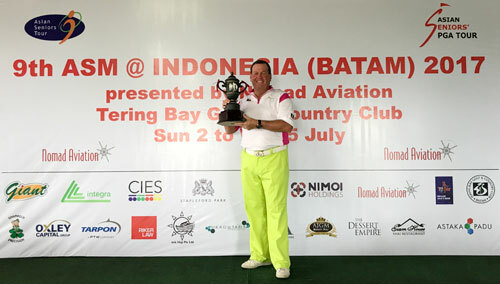 Amphon is hoping for a back to back victory in next weeks US$100,000 ASM Malaysia to be held at the magnificent IOI Palm Garden Resort in Kuala Lumpur. 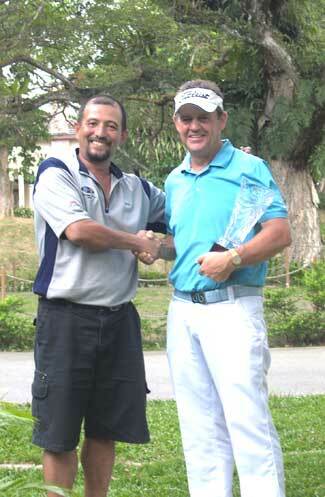 Bill Evans (Australia) after achieving a great Hole-In-One on the first day. 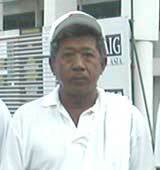 Singapore's leading professional was home club professional Lim Swe Chew. In the amateur section Mark Lamb, a scratch marker was the ASM Singapore Overall Amateur Champion and qualifies to play in the ASM Malaysia semi finals along with 15 year old Johnson Poh of Changi Golf Club whom was the overall ASM Singapore Junior Champion. 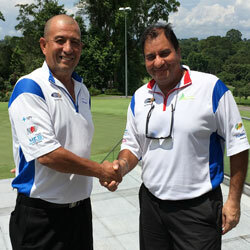 Both players will face stiffer opposition in Kuala Lumpur where Singapore's leading amateur Choo Tze Huang and Feldman Tan, respectively the 2003 ASM Singapore and 2005 ASM Malaysia defending champions will play alongside the senior professionals in the ASM Semi finals on 17th and 18th November. 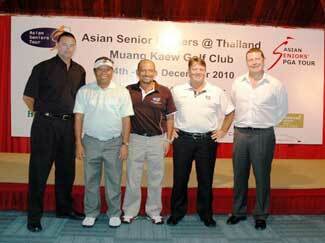 The 2006 ASM Malaysia was staged from 17 - 19 November 2006 at the Palm Garden Golf Club.